Air pollution is suffocating denizens of Kathmandu and it can create havoc if not controlled soon. We have been battling with this scourge for generations. I doubt if the future generation will be able to get rid of this problem. In the capital city itself, we are struggling to find a safe zone to breathe fresh air. Couple of days back, while commuting from Gaushala to Koteswor, I was caught in a tsunami of dust. It followed me everywhere, with every breath I took and every move I made. Every time I take a ride, the dust envelops me turning my bright clothes into dull rags within no seconds. If I walk, it is worse. Windcheater, scarf and masks are what I use these days to protect myself from dust but in vain. This is the plight of the city dwellers. I wonder how much dust Kathmanduities inhale each day and how much is accumulated in our bodies. 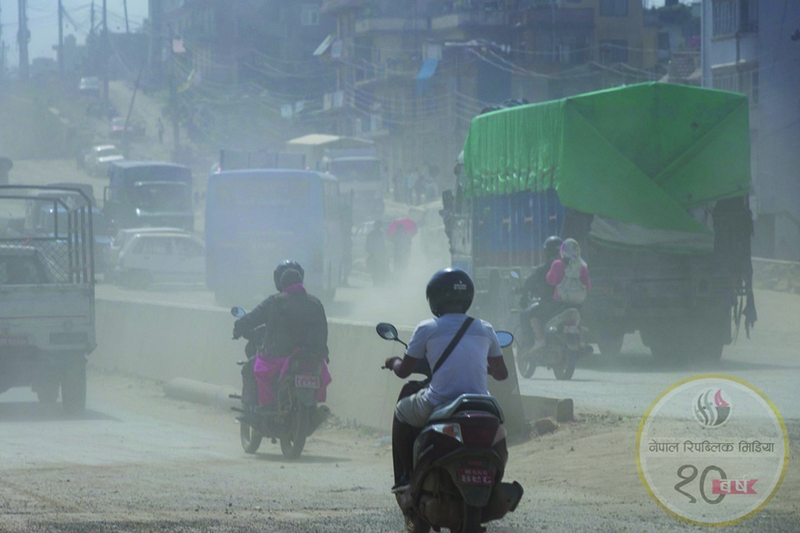 Dust pollution has choked Kathmanduities and the city is suffocating. It’s agonizing to know that Kathmandu has been ranked fifth in 2017 Pollution Index. Dr Andrew Lodge reports in The Guardian that the smog in Kathmandu is five times worse than the levels which prompted Paris to ban cars. The recent report entitled “Heat and dust: Kathmandu’s commuter’s hell” in the same newspaper has tarnished the image of our capital city. We have been growing up listening to the tales of the incredible beauty of Nepal. We have heard the stories of Kathmandu being a repertoire of surprises and delights captivating the visitors and tourists alike. Dust pollution has become the new identity marker of this valley now. The government must take measures to destroy this ugly identity. The worst culprit of valley pollution is the lack of swiftness in underground installation of Melamchi drinking pipes along with the road expansion project, which is taking months to complete. Overpopulation, unmanaged waste, unplanned urbanization and untamed motorization have added to the woes. Government’s reluctance to replace the old and outdated vehicles with new ones has aggravated the situation. The ongoing boom in the real estate has also pushed the pollution level to a new height. Poor maintenance system of vehicles, less qualified and skilled technicians, adulterated gasoline and poor quality of roads further amplify pollution level. The dust generated from these then forms a toxic haze that hangs over the atmosphere for a prolonged period of time. United States Environmental Protection Agency states that people exposed to toxic air pollutants have an increased chance of catching cancer or experiencing other serious health issues. These health effects can include damage to the immune system, as well as neurological, reproductive, developmental, respiratory and other health problems. Toxic air pollutants such as mercury can deposit onto soil or surface water, where they are taken up by plants and ingested by animals and are eventually magnified up through the food chain. Like humans, animals may experience health problems if exposed to sufficient quantities of air toxics over time. Likewise, the 2016 report by World Health Organization mentions that 92 percent of the world’s population lives in places where air quality levels exceed WHO limits. More than 80 percent of people living in urban areas are exposed to air quality levels that exceed WHO limits. “While all regions of the world are affected, populations in low-income cities are the most impacted,” says the report. According to the report, air pollution causes over 9,000 deaths every year, with coronary artery disease and strokes each killing more than 3,000 people in Nepal in 2012. Nepal is in dire straits because of pollution. Sustainable plans and policies are being made, but they have not helped a bit. In order to help denizens breathe fresh air, we need to come up with some immediate actions. We need to scale up public transport, integrate multi-modal transport options, and encourage walking and cycling. Most of all, we must start with massive tree plantation. Words are not enough. We need actions. Conferences are held every now and then to address the flaws. It has not helped much. “Healthy mind exists in a healthy body,” goes a popular saying. For a healthy and sound state, healthy citizens are a must. This we can achieve when we get to inhale fresh air.